Destroyer Boulonnais (1,500 tonnes class) in June 1939. Marius Bar photograph. An improved version of the 130 mm (5.1") Model 1919 with an autofretted barrel. 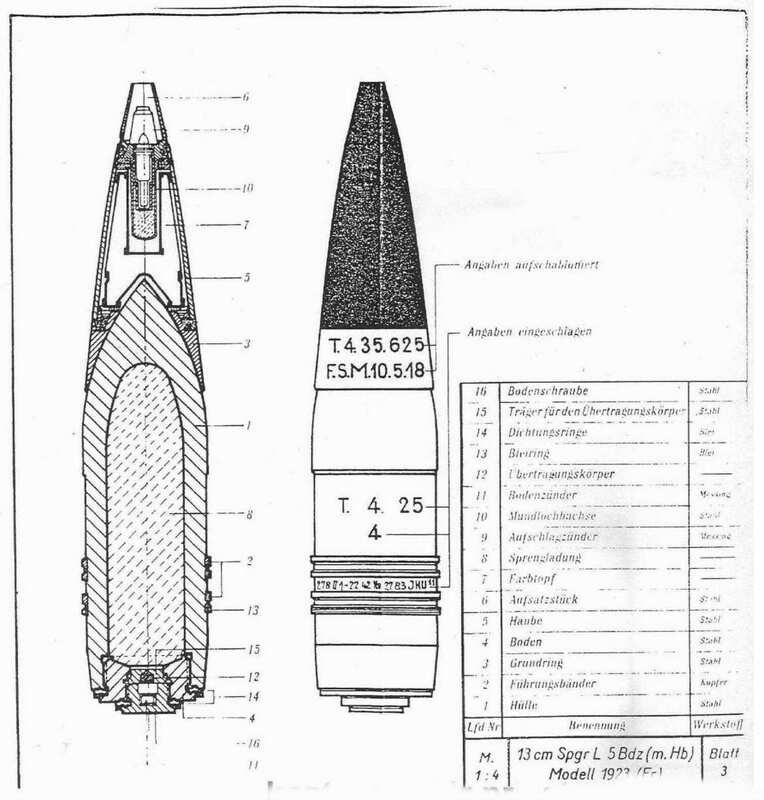 Essentially, this was a scaled-down version of the 138.6 mm/40 (5.46") Model 1923. Used the same ammunition as did the earlier weapon, but its slightly lower maximum elevation gave it a correspondingly shorter range. Constructed of a built-up autofretted barrel and used a Welin breech mechanism. ^In theory this gun had a firing cycle of about 8 - 9 rounds per minute but in practice it was closer to 5 rounds per minute. This was partially because Inhibitors had been installed to prevent firing unless the ship was in the middle of a roll. Unfortunately, the ships rolled badly in heavy seas and heeled greatly at large rudder angles. The inhibitors also had the effect of slowing or halting firing when they malfunctioned. 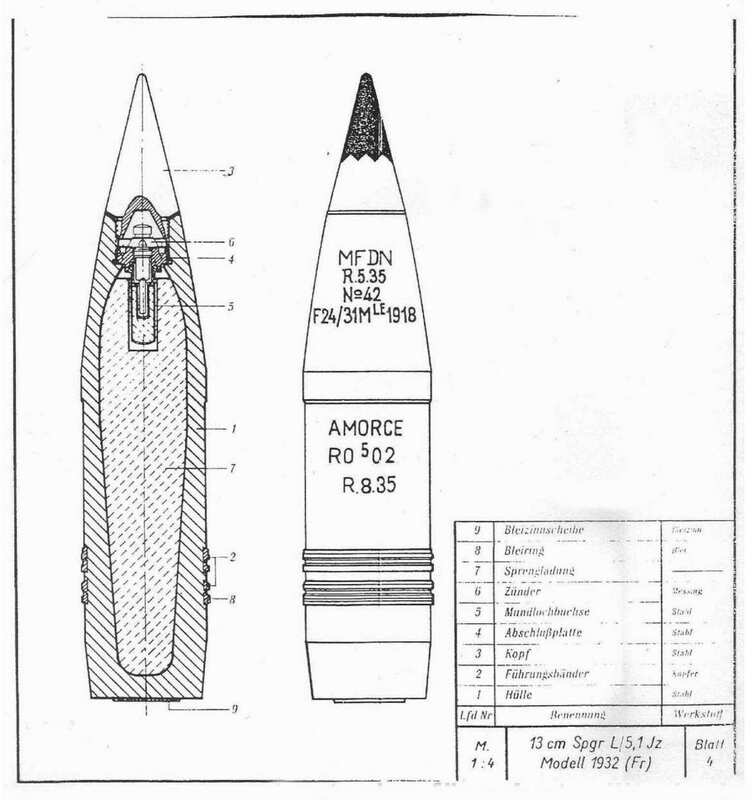 ^This same ammunition was also used for the 130 mm (5.1") Model 1919. ^Dye was introduced about 1938 with red issued for the lead ship in the flotilla, green for the second and white (later yellow) for the third. See sketches below. ^Magazines held 440 projectiles and 462 charges along with 60 starshell. In addition, ready racks were fitted next to the guns and these each held 24 rounds. This data is from "Destroyers of World War Two" and "French Destroyers." This data is from "Warships after Washington" which notes that the low muzzle velocity of this gun made it inaccurate at long ranges. ^The shields for this class were the new "wrap-around" type and was larger than on the preceeding class. Hoists were identical to those for the Model 1919 with two hoists serving the four guns. ^Gun No. 4 was replaced in 1940 by two Thornycroft DCT on eight out of fourteen of these destroyers. The destroyers Brestots, Foudroyant, Boulonnais, Fougueux, Frondeur and Forbin retained the gun. 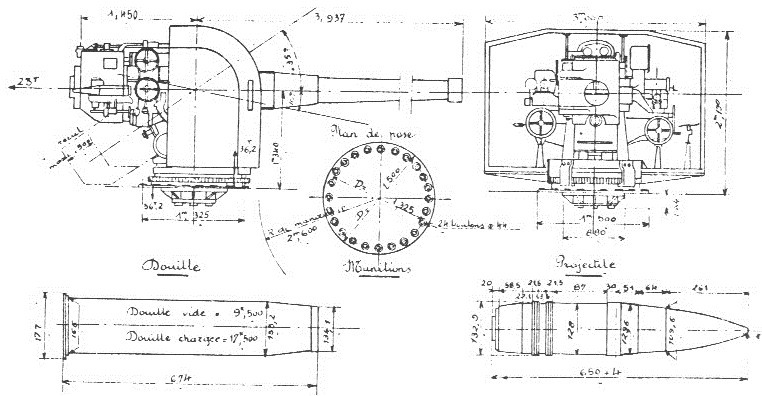 Following the Armistice, Le Mars, La Plame, Bordelais and L'Alcyon had the gun reinstalled during 1941. The other four destroyers were either lost or interned at Alexandria, Egypt. ^Unlike the 130 mm Model 1919, this weapon used an automatic spring-powered rammer which gave it a slightly faster firing rate, but loading was difficult at angles over 15 degrees. The automatic loading tray that was retrofitted to the Model 1919 was used on these ships as commissioned. The trunnion height for this mounting was 6.3 inches (16 cm) lower than the preceding 130 mm Model 1919 mountings in order to ease loading but it was still relatively high in order to allow a large maximum elevation. 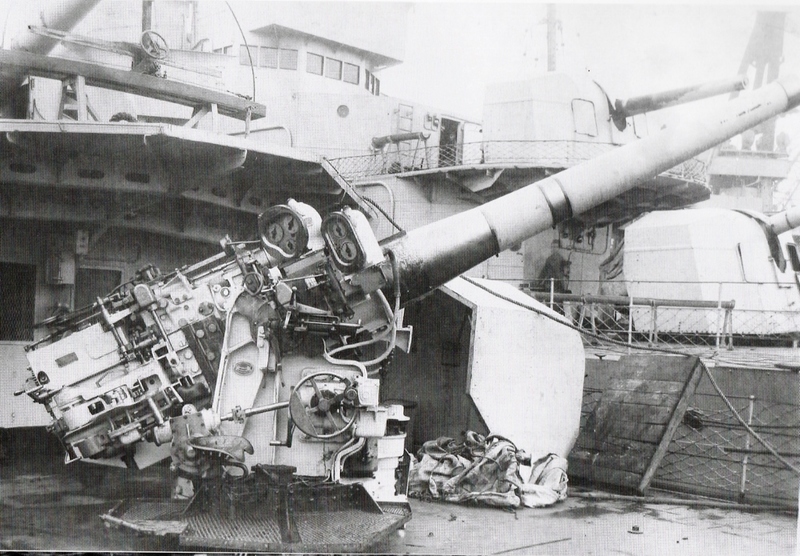 Although they used an automatic spring rammer for shells - the cartridges being hand loaded - the trunnion height hampered working of the gun at elevations greater than +15 degrees. 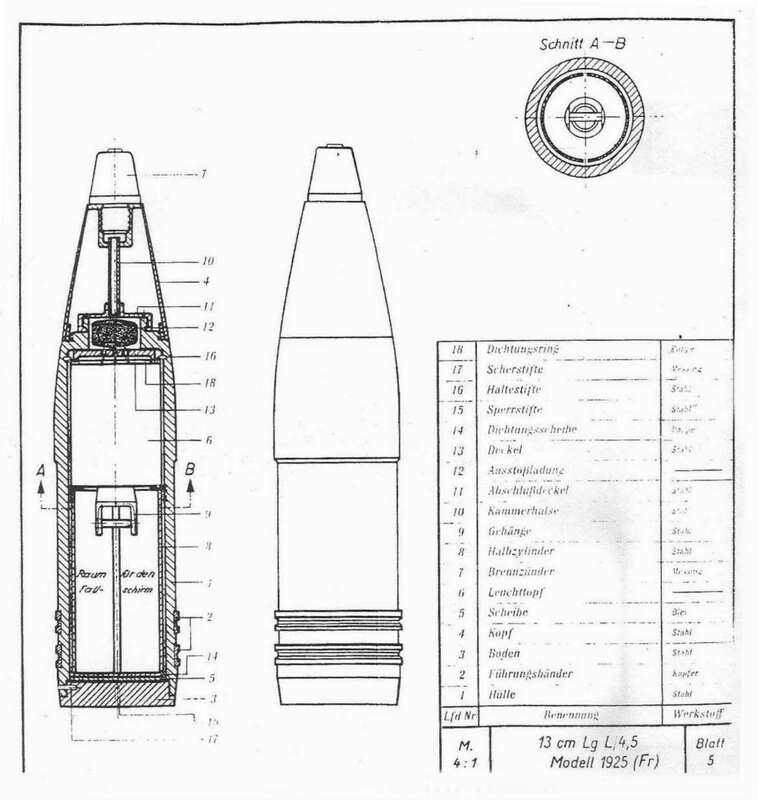 130 mm/40 M1924 and ammunition. Official sketch in the collection of Robert Dumas. 130 mm/40 Model 1924 being installed on an unidentified destroyer. Note the Granat GD II dials which showed tangent elevation and deflection. 130 mm HE Projectile. Sketch from M.Dv. Nr. 170,76. 130 mm SAP Projectile with dye color (Find No. 7 - "Farblopf"). Sketch from M.Dv. Nr. 170,76. 130 mm Illumination Projectile. Sketch from M.Dv. Nr. 170,76. 130 mm casing for SAP and HE. Illumination used the same casing but with a different propellant loading. 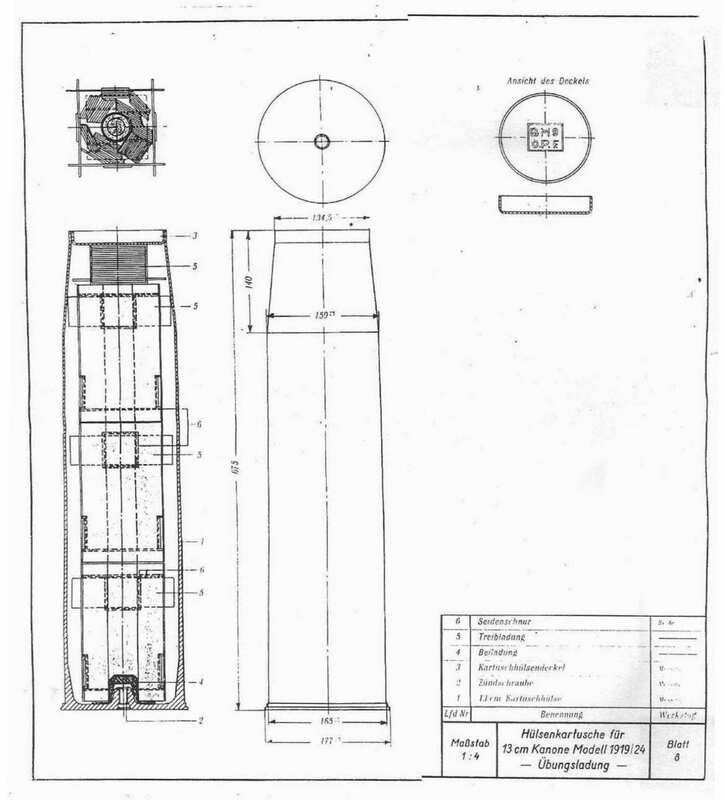 This sketch shows the casing as being 675 mm long, but the previous French sketch shows it as 674 mm. I have chosen to use the French length in the Ammunition Table above. Sketch from M.Dv. Nr. 170,76.